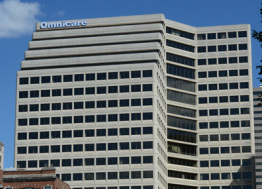 Located at the southeast corner of 4th Street and Main Street, Omnicare Center is at the doorstep to Downtown Cincinnat's "playground"!! The Banks, Great American Ball Bark, Smale Riverfront Park, and Paul Brown Stadium are all within a 5-minute walk. Follow the photo links below to learn more.